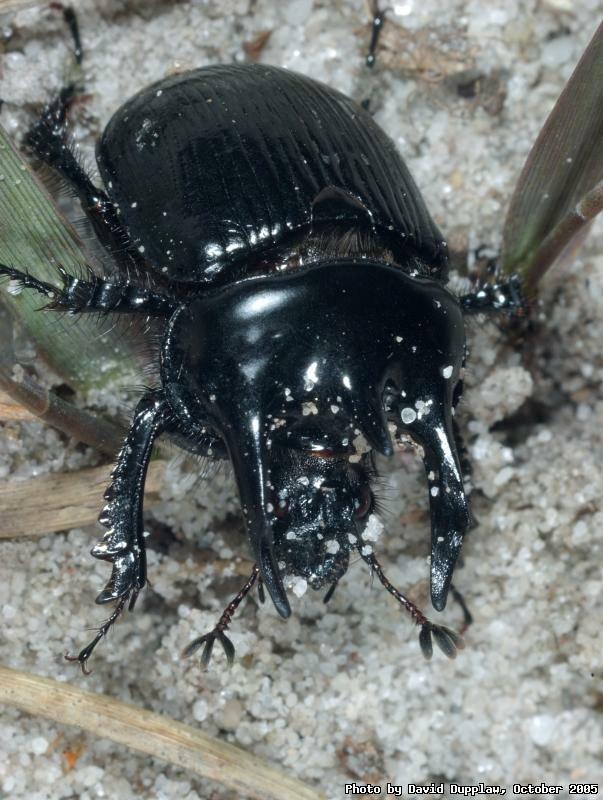 The Minotaur Beetle (Typhaeus typhoeus) is the only dung beetle in Britain that rolls dung balls along. The female digs a tunnel, upto a metre long, straight down into sandy soil. It uses those serrated front legs to dig tributary tunnels that will be used to store dung balls. The male, meanwhile, goes looking for rabbit or sheep droppings, which are helpfully spherical, and rolls them back to the tunnel where they are stored. The female lays an egg and leaves to do it all again. I found this beetle upside down in the middle of a sandy path at the Dorset Wildlife Trust nature reserve called Sopley Common, when we visited last weekend. I helped it back onto its feet, but it kept rolling over. I am not sure if it was a defence mechanism (to look like it was dead), but I helped it up anyway and [after taking photos] put it out of the centre of the path where it was less likely to get stepped on.